Cleaned my sensor today! I was a little scared to do it, but it really helped and didn't seem to do any damage! Sadly I still have some dust, but it's barely noticeable compared to before the cleaning. I wanted this shot to focus on patterns, inspired by the neat looking clouds. I'm not sure how the branches AND the power lines add to the shot, but I was using my 60mm and didn't have the ability to zoom in or out, and my angles were quite limited. Cheers! I love the feeling of this shot. I am petrified to try to clean mine. Time to do some reading on this and get to it. Cool shot! I like the light and mood! Hooray for patterns. Best science unit I ever taught. Great shot. I'm too terrified to clean mine!! Nice shot though- love the mood. Nice picture ! 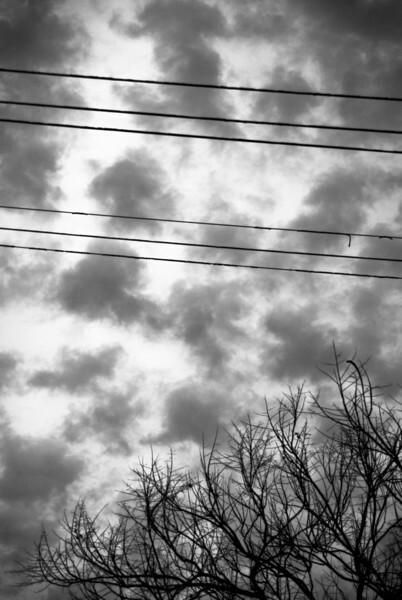 Dramatic sky and the b&w treatment make a kind of "end of times" mood with the power lines and the tree silhoutette.